Oregano tea has unique health benefits. The oregano, apart from the aromatic spice that we put in our food, can do wonders for our health, when used as a herb. Greece is widely known to have the best oregano grade in the world. There are many ways to take advantage of it. One is the oregano oil. The other is to make Greek oregano tea. Although oregano has been used since ancient times for its healing properties, research now confirms that the minerals and vitamins contained its decoction make it an excellent complementary drink for many reasons. Some of the nutrients are vitamins A, C, K, along with minerals such as iron, magnesium and calcium. Additional nutrients such as omega-3 and flavonoids, add up to its beneficial properties. Throughout the conduct of many studies, it has been proved that some substances found in the oregano, act against cancer. One of them is phytochemical quercetin, which does not only slow down the cancer growth, but it also triggers the process of apoptosis. A cup of oregano tea is the indicated antibacterial dose for the whole day. This herb consists of oils known as thymol and carvacrol, which are known enemies of the bacteria. Oregano can easily cope with bacterial infections better than tinidazole, a well-known drug. The regular consumption of oregano tea also helps to deal with any type of microbial contamination, by inhibiting their growth. The oregano and its decoction are both natural sources of omega-3 fatty acids, which are essential for the reduction of inflammation throughout the body. They are also known to reduce the risk of developing cardiovascular diseases and arthritis. Oregano tea can be used to reduce the symptoms of an asthma attack. Inhale the oregano water vapor, while the beverage is still hot, in order to help clean the nasal and respiratory tract. However, this method needs to be repeated at least 4-5 times a day for actual results. Oregano tea is a source of fibers. A good fiber consumption helps control weight by keeping the whole body in good physical condition and also reduces the likelihood of diseases related to obesity. 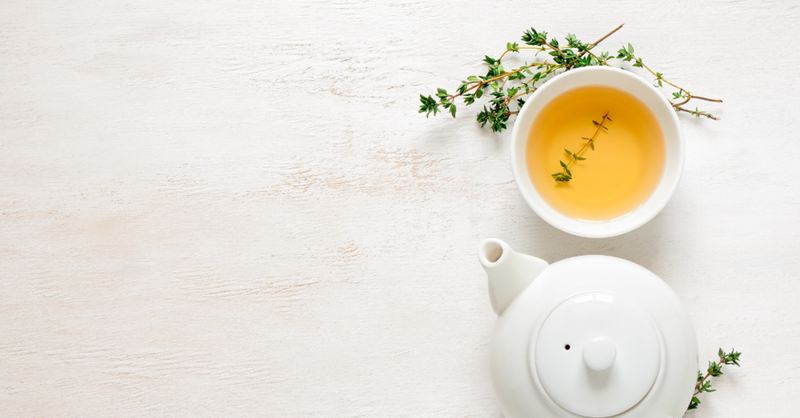 Enjoy a cup of Greek oregano tea right after your meal! Some of the oils found in the tea can help in both the support and the relaxation of the gastrointestinal system. Many botanists are suggesting a large cup of oregano tea to support a good digestive function. The oregano tea will effectively aid the treatment against parasites, eczema, ear and fungal infections. It will help reduce unwanted gases, gastrointestinal disorders, dyspepsia, urinary problems. It enhances the digestion of food as well as its absorption. As this tea is a great source of vitamin C, it helps empowering the defense mechanisms of the body. A hot cup of oregano tea is an effective treatment for period cramps, bloating and reduction of abdominal pain. People who suffer from rheumatism can be relieved by drinking hot oregano tea mixed with honey. It acts as a sedative for the nervous system. It helps to the treatment of colds, flu and mild fever. Let's Make Some Greek Oregano Tea! Pour 1 or ½ tablespoon of Greek Oregano into 1 cup of boiling water. Cover the cup up for 5-10 minutes and let the oregano soak. The estimated time of soaking depends on how powerful you want the beverage to be. Drink it once or twice a day, plain or mixed with honey. You can also add a few drops of fresh lemon juice. Remember to consume it while it's still hot! It should not be consumed by pregnant women, as it is considered to reduce the iron absorption capacity. Those who are also hypersensitive to herbs from this family may experience negative symptoms such as allergic reactions, skin irritation, even vomiting. It could cause stomach upsets in some people. Oregano and Oregano Tea are useful if they are consumed in the right quantities and in the right way.